Don’t set Your Motion Detector Off By Mistake! Our motion detectors are really sensitive – which is a good thing. It assures you that your home is always protected. But if you are new to the system, it can be easy to trigger a false alarm. 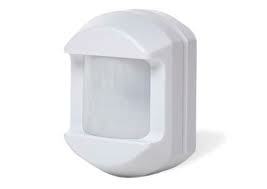 To help you avoid this, you should understand how a motion detector works. It uses passive infrared technology, which means you not only have to avoid movement while the sensor is armed but light and temperature shifts as well. Bugs and insects The sensor has built in protection to prevent bugs from getting into the sensor and causing false alarms. This doesn’t stop a bug from crawling across the face of the sensor though and this can trigger an alarm. HVAC Heating and air conditioning ducts should not be blowing air onto the sensor. The detector can’t see the air but it notes the change in temperature and this can cause a false alarm. Moving objects Anything that can sway or move because of an air current. Things like curtains, blinds, balloons, loose paper or other items that might be blown around by the heating and air conditioning ducts are an issue. Vibration Make sure that the sensor is mounted on a solid surface and does not vibrate. Vibration may not only cause the sensor to move a little but it can also cause the fields of view in the room to move triggering a false alarm. These are the reasons why we will not install a motion detector in a garage! What is Two Way Voice and Why Do I Need It? Two Way Voice is Vital, it reduces false alarms and can lead to verified, faster police response times. event ually the monitoring station will receive all the information and attempt to call back the premise on the premise’s land line. Typically the burglar or home intruder do not answer the telephone call (go figure). The monitoring center next calls the police and informs them that an alarm is going off but they could not verify if it is an actual intruder because no one answered the phone call. 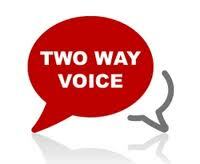 Two Way Voice is different, Especially Two Way Voice by Burns & McBride. Two Way Voice allows the central station to communicate through a speaker phone built into the Go!Control alarm panel only after an alarm has been triggered. It allows our Central Station operators to instantly talk to you through the alarm panel and to hear what is going on inside the house if you are not home. We have heard footsteps, movement, rummaging, glass shattering, and even people screaming. When we hear any type of movement inside the house we then verify to the police that this alarm call is a “crime in progress” which they love. Police often respond very quickly with a higher priority to verified alarms opposed to unverified alarm calls because 98% of all alarm calls are false. In fact, many cities have enacted verified alarm policies where they refuse to respond to a unverified alarm signal. Burns & McBride’s Two Way Voice is even better. We use Two Way Voice over the cellular network. Most companies that provide Two Way Voice provide it only over the telephone (POTS) line. This is great until your phone line is cut or tampered with not only disabling your Two Way voice but also disabling your whole alarm system. Two way voice is a standard feature of the Burns & McBride Smart, Safe home system. Just one more way that our Smart, Safe Home helps you and your family. Other security dealers offer two way voice but it is normally not a standard feature. Here is a video from one of those companies which does a good job of explaining the benefits of two way voice. How would you like a reminder that you forgot to arm your system? One of the biggest problem with any alarm system is that people forget to arm it when they leave home. All the benefits of energy management and home security are lost if no one turns the system on. How about if it could send you a note reminding you that you forgot to turn it on? We are please to announce the launch of Geo-Services technology, powered by Alarm.com as a standard feature of our Smart, Safe Home system. This free service enhancement allows you to make “geo-fences” – radius’s – around your home, through the use of an iPhone or Android device. The technology sends reminders to users’ iPhone or Android devices to arm their security systems when arriving in or leaving the preset area or tells you that someone has left the area. You can even set up different sites – maybe work or your child’s school. With industry technology evolving so quickly, there are many great services available to home security customers. Customers sometimes leave their homes unprotected even though they have a security system in place because they don’t arm it, putting them in harm’s way. This new feature and the convenient one touch app is another layer of protection for users. It is one more way to take advantage of technology simply and afford ably too make your life a little easier. After creating the “geo-fence,” users customize automatic geographic and time-based arming reminders that are sent to their handheld device when the preset radius is entered or exited. 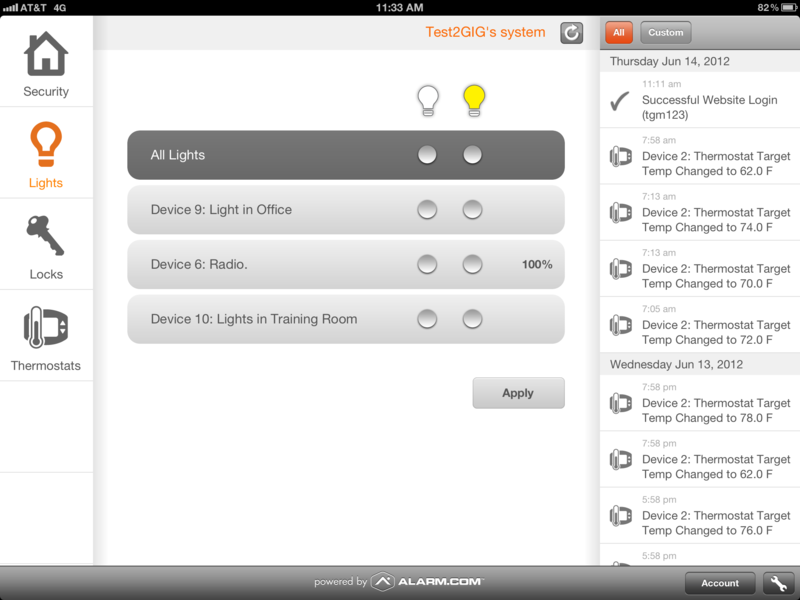 Users can enable this feature through the latest Alarm.com iOS app (v2.1), and the latest Alarm.com Android app (v1.4). Alarm.com’s initial set of Geo-Services will include a location-based version of the company’s popular Arming Reminders feature, allowing users to receive an alert if they leave their home “geo-fence” without remembering to arm the security system. More features are on the way. Alarm.com’s Geo-Services will be a user set option and also support applications where multiple mobile phones are used to trigger a rule. For example, when both Mom’s and Dad’s mobile phones are outside of the Home geo-fence on a weekday morning, a Geo-Services rule can be triggered to arm the security system, lower the thermostat and turn off all the lights. 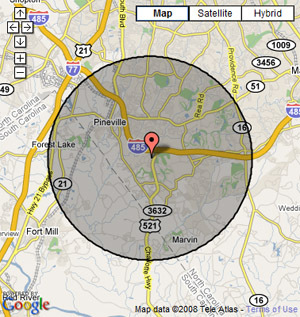 Users will also be able to define custom geofences around other significant locations like a second home, child’s school, or workplace, enabling more sophisticated rules in the future that look at multiple phone locations relative to multiple geofences to decide whether to change system settings or trigger notifications. Once this technology is enabled on the customer’s account, a default geo-fence is set up around the system address; you have the option to create additional geofences as well. Arming Reminders, tailored to the customers’ individual needs, are then created for each geo-fence. Customers can specify dates, times, and the recipients of the reminder. To preserve the battery life of the phone, Alarm.com minimizes the use of GPS and relies on cell towers where possible to provide accurate location information. Download the latest version of the Android or iPhone mobile app onto your mobile device. Log in to your mobile app on any supported phone and enable Geo-Services from the Settings menu. Geo-Fences – By default, a geo-fence is set up around your installation address. From this screen you can edit, add and delete geo-fences. Edit ~ To edit a geo-fence, click on the fence name or the for the fence you want to edit. Here, you can update the fence location, name and radius. To edit a fence location, click and drag the to a new location on the map or type the address into the text box and click . To edit the fence name, type the new name into the text box under “Fence Name.” You can edit the radius of the fence by clicking and dragging the boundary markers ( ) to increase/decrease the radius or by manually entering a value in the “Radius” text box. Make sure to click “Save” before navigating to a new page. Delete ~ To delete a fence, click on the fence name and select . Note that deleting a geo-fence will delete any rules or notifications that depend on the fence. Geo-Devices – Once enabling Geo-Services on a device, it will show up in the Geo-Device list where you can then edit or delete the device. Delete ~ To delete a geo-device, click on the device name and select . Note that deleting a geo-device will disable Geo-Services on that device and remove it from any rules or notifications that depend on its location. Geo-Features – the following geo-compatible features are available. Arming Reminders ~ set up an arming reminder to check the arming state of your system when you cross a fence boundary. Go to the Security/Arming Reminders Tab. The Arming Reminders screen allows you to be notified if your system is not armed by a certain time each day. – 1. Condition: You can set up an arming reminder to check the arming state of your system at a particular time or when you cross a geo-fence boundary. A geo-fence arming reminder can be set up for when you cross a fence at all or specified times. – 2. Day(s): Check the box(es) under the day(s) of the week you would like to be notified if your system is not armed by the specified time. Be sure to click the “Save” button if you make any changes. To delete an Arming Reminder, click the “Delete” link in the row corresponding to the Reminder you would like to remove. To edit an Arming Reminder, click on the “Edit” link in the row corresponding to the Reminder you want to change. When you’re finished editing the rule, click the “Update” link to apply your changes. Once you’ve setup the geo-fence, you’ll want to create a way for the system to automatically remind you to arm the system. Click on the picture below to see a brief video. There are some excellent videos on your alarm.com website that explain just how geo0fencing works. Can I control my system from the second floor? Maybe you hear a noise in the middle of the night and want to call the police. Or maybe you want to turn the heat up or down, without going downstairs. We are pleased to announce the availability of our new Smart, Safe Home Secondary Panel, which enables increased accessibility to the smart home features managed through the Go!Control panel, the heart of our home automation system. based on the award winning GO!Control panel, we can locate this device anywhere in your home to give you easier access to the system. Our Go!Control system gives customers the ability to easily manage every aspect related to their home’s automation system. We also have a mobile app that allows our customers to stay connected to their system no matter where they are. However, we heard from several users who thought that when they were at home, having all those features centralized in one control panel wasn’t always convenient. Users can have up to four of the Secondary Panels installed, in a customized configuration that best addresses the needs of each unique situation. Our job is to provide essential services to homeowners. 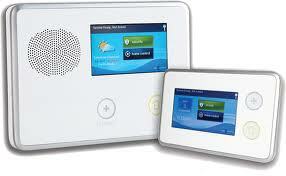 one of those essential services is home security and automation. We provide affordable home automation to help protect families, allow them to use energy more wisely and simplify their lives. The big screen: Let’s face it; the iPad screen is beautiful and offers a lot of room to have multiple controls and notifications on one screen. Now you can navigate your system remotely without having to tap through multiple screens, which makes the experience a bit faster and more fluid. The app also works seamlessly in landscape and portrait mode. Multiple video feeds: Now you can view all your video feeds simultaneously and enjoy much easier access to pan and tilt controls and recordings. You can quickly open, delete, or protect triggered video clips—all on the same screen. Centralized access: Along with multiple video clips, the iPad also allows you to control everything in your home all at once. You can check the status of your locks, thermostat, lights, and appliances and change their status quickly, each on their own screen. You can also see all of your lights and Z-Wave appliances with limited scrolling. System history: As you click around on the app, it will show you the history of related items and help you remember where you’ve been and what you’ve changed. The app also allows you to sort your saved video clips with event and video filters. The system history will automatically adjust and scroll to show the history events related to the screen you are currently viewing. Nothing can take the place of a picture though. 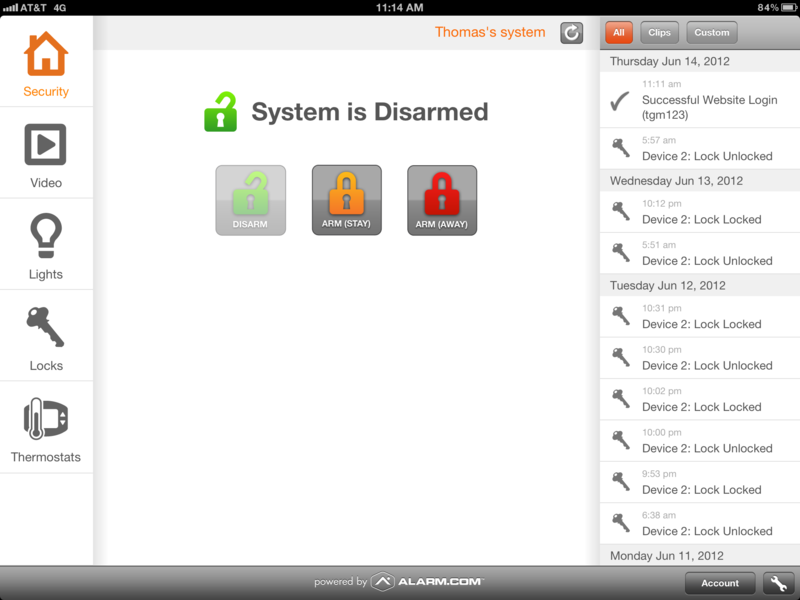 You can arm or disarm your home right from your iPad. You can see the history of what has happened with the system on the right side of the screen. Raise or lower your thermostat remotely. 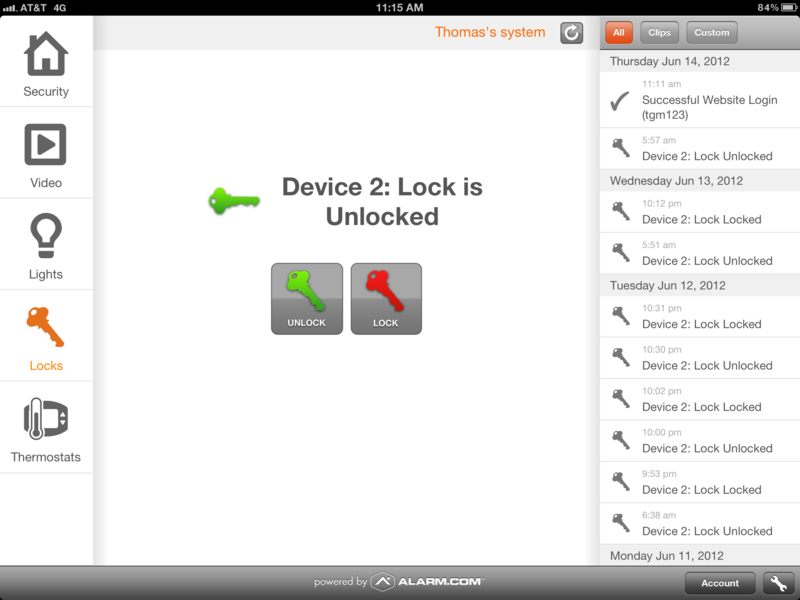 Lock or unlock the door remotely. You might want to let a serviceperson into your home while you are away. You can also see when the door was locked or unlocked in the right side of the screen. You can control lights and other electrical items from your iPad. Turn lights on or off – or even dim the bulbs. Or you might want to turn a coffeepot on before you come home. 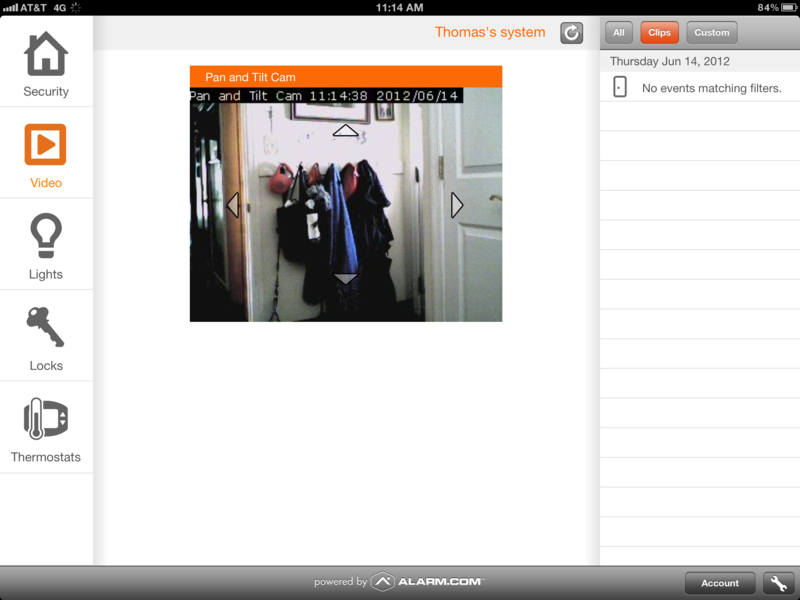 Cameras can be added to your system very easily. Check on kids or pets while you’re away. To connect lamps and appliances to your Z-Wave network, you used to plug a module into your power receptacle and then plug your lamp/appliance into the module. Now, Z-Wave has an in-wall receptacle, making it unobtrusive. The Evolve Wall Receptacle replaces standard wall receptacles. The receptacle contains one Z-Wave AC outlet and one standard AC outlet. An LED shows feedback that the controlled device is working. The duplex receptacle enables wireless control of on/off functions for standard incandescent table and floor lamps, fluorescent table and floor lamps, and small appliances. It replaces your current electrical outlet, uses your existing wiring, and provides a Z-Wave enabled outlet for the lamp/appliance that you would like to control and a regular pass-through AC outlet for other electrical devices. The receptacle requires in-wall installation with hard-wired connections. Any device displaying the Z-Wave logo can be incorporated in your Z-Wave network. Since Z-Wave operates on RF frequencies and every device is a repeater, the more devices you use, the better your network functions. What the Heck is “Z-Wave”? 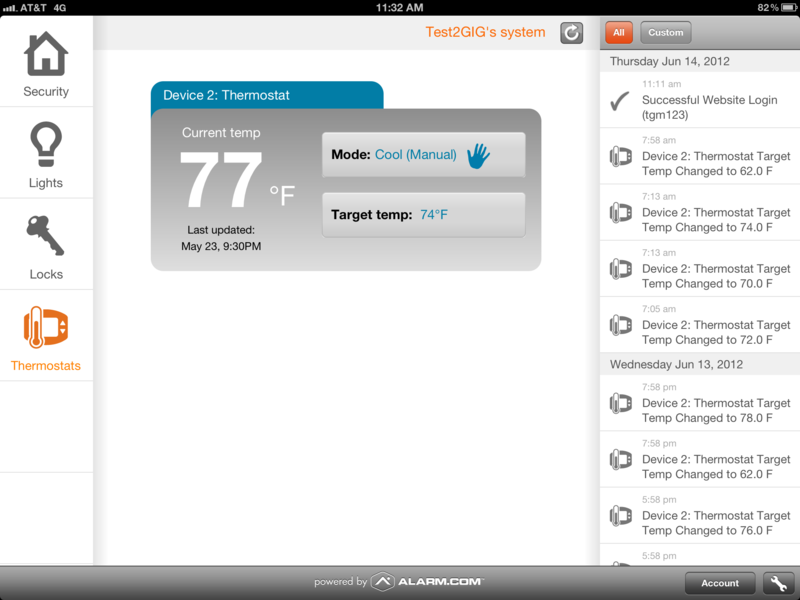 Z-Wave lets you build your home control system as your needs grow. As just one example, let’s say you started by adding Z-Wave remote control to your home lights. You can easily program them to shut off when you’re at work, and turn back on to welcome you when you return home, saving energy and money. You could then introduce more functions to this basic setup. Just add Z-Wave to your garage door, your home entry, and your home security system. When you arrive from work, push a button and all your Z-Wave devices will work in concert — the garage door will open, your entryways will light up, your security system will recognize you, and your front door will unlock. How’s that for remote control? Once you’re inside, your home can welcome you with just the mood you want. Z-Wave can have your favorite music playing for you on arrival, and the thermostat set to your preferred temperature. While you were away, Z-Wave made sure the lawn sprinkler watered your lawn on schedule. If it had rained, you could have bypassed the sprinkler from work, from a PC or even a cell phone. When you’re ready to call it a night, a single button could turn off your house lights, activate your security system, turn down the thermostat, lock the doors, turn on the bedroom humidifier, and set up the coffee pot to greet you with a fresh cup when you awake. All with one button. All added easily and inexpensively to your home. All with no new wiring. And all according to your budget and timetables, to meet your needs and your lifestyle. Z-Wave gives you simple, affordable, personalized control solutions.